VDirect-vent Heritage Stoves come standard with Empire's Slope Glaze Burner system with expanded ember bed for extra glow. Ceramic beads within the burner swirl and tumble the gas to create naturally swirling flames that are indistinguishable from a wood fire. Topped off with the hand-painted ceramic fiber log set and glowing embers, the effect is stunningly realistic and guaranteed to keep you and your guests mesmerized for hours. 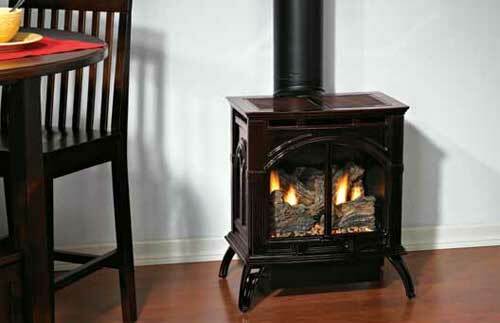 Our medium stoves are rated at 27,000 Btu and stand just over three feet tall. The richly detailed casting features fully operable decorative cast iron doors on durable lift-pin hinges that swing open 180 degrees. Choose from five finishes - porcelain black, porcelain mahogany, porcelain sand, matte black, and matte pewter. Each of our porcelain stoves starts with a hand-applied pigment and glass mixture that's oven fired to 1,500 degrees Fahrenheit to produce a rich durable finish that both softens and highlights edges. Our porcelain finishes capture and reflect room light for exceptional visual interest. The porcelain mahogany finish features light and dark accents, for added visual interest. Our matte finishes, in pewter or black, give your stove a more contemporary look that shows off every exquisitely intricate line and edge of the casting, from the geometric crosshatch detail to the raised ribs along the classically curved legs. The optional side shelf sets, available in every stove color, install in seconds to create an old-world look for your Heritage stove. Floor pads are available, but not required. 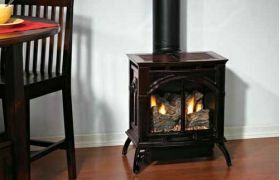 You can place your Heritage Stove directly on carpet or tile.